Krissy Wendell-Pohl, left, and Natalie Darwitz of Team Lululemon take a break during a victory over Consistently Cuatro on Saturday during the U.S. Pond Hockey Championships on Lake Nokomis in Minneapolis. Natalie Darwitz anxiously stands in the massive warming tent just off Lake Nokomis in Minneapolis. She is many things: Wife, mother, business owner, three-time Olympic medalist, Gopher legend, college head coach. But at the moment, just before 8 a.m. Saturday morning, the unofficial general manager of Team Lululemon at the U.S. Pond Hockey Championships is uncharacteristically clueless. There’s a delay, and there’s no explanation why. “I got a game at 2,” she nervously says, referring to her duties as head coach of the women’s hockey team at Hamline University. When someone finally announces that all games are delayed two hours due to ice conditions, Darwitz blasts out text messages to her teammates and laments the havoc this creates for her and several others. But the truth is, GM Darwitz has assembled arguably the most decorated roster in the event’s history: Two Olympians, four others who played on the national team, and six of the eight won at least one NCAA title. 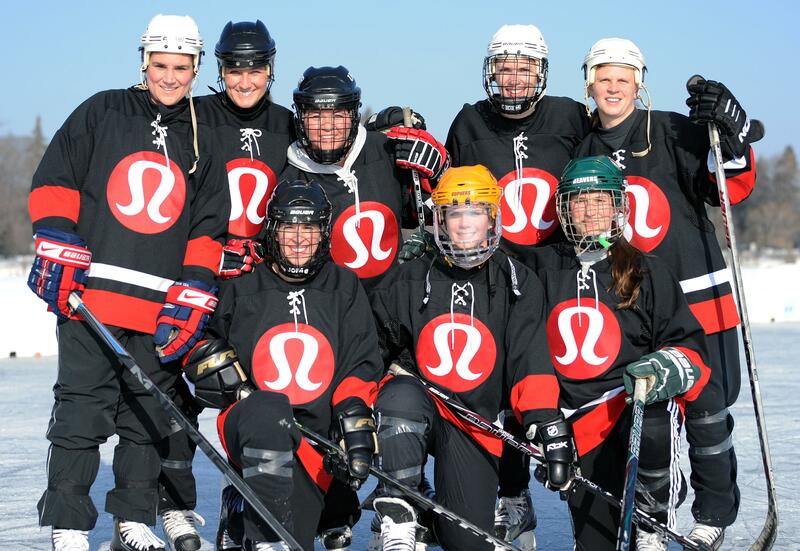 Team Lululemon’s first game is against Consistently Cuatro, a team comprised of Gustatvus Adolphus College hockey players who finished fourth in the nation in four consecutive seasons. But Molly Carroll, one of the former Gusties, knows some of her opponents, especially Darwitz, who coached her at Eagan High School. Besides, Consistently Cuatro won the women’s division in 2015 — and Team Lululemon had not practiced together nor played on a pond in quite a while. Serendipity, after all, provided this opportunity. Darwitz was Christmas shopping at lululemon at the Galleria in Edina late last year when she was approached by another customer in the checkout line. “Are you Natalie?” the woman asked. “Yes I am,” Darwitz sheepishly said. Finally, Darwitz arrived at the register — but more attention awaited. After a brief exchange, the employee asked one final question that floored Darwitz. The employee was in management, and the company was one of the tournament sponsors. They had a men’s team but didn’t have a women’s. “I was like, ‘Uh, give me a day or two,’ ” Darwitz recalls. But Darwitz didn’t have any problem getting commitments to fill her team, including one from former Gopher and Olympic teammate Krissy Wendell-Pohl. The players welcomed a chance to take a break from their hectic lives. Winny Brodt-Brown, Wendell-Pohl and Angie Keseley (now Johnson) are mothers; Erica McKenzie and Sadie Lundquist, standouts at the University of Minnesota and Bemidji State, both work on the Fan Relations Team with the Minnesota Wild; and Becky Kortum, a two-time national champion with the Gophers, is set to graduate from medical school at the University of Minnesota next year. 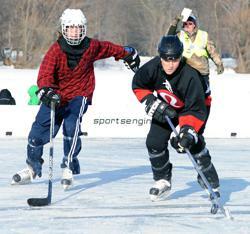 Brodt-Brown and Darwitz separately acknowledge that hockey on a pond is distinctly different from hockey in a rink. But both fondly recall playing on ponds as little girls, often against boys. But the competitiveness and high hockey IQ kick in once the game officially starts after 10 a.m. In a physical game, Team Lululemon defeats Consistently Cuatro 10-4. Darwitz and Wendell-Pohl cannot play in the second game Saturday, but their teammates roll the Delta Lumberjills, 27-0. In the changing tent afterwards, Brodt-Brown jokingly notes that her team is heavy on offensive players. Lululemon players, front row, from left: Winny Brodt-Brown, Becky Kortum, Sadie Lundquist. Back row, from left: Erica McKenzie, Krissy Wendell-Pohl, Kait Mason, Angie Kesely, Natalie Darwitz.